Thank you to The Blythe Daniel Agency and The Blog Spot Network for providing this book for review. I often feel lonely in terms of friendships. I don't know what changes in adulthood that makes new friendships so hard to come by, but moving from Virginia to Maryland, then moving from one part of the state to another has often left me with depressing moments of feeling friendless. It's not true, and I know this: I couldn't ask for a better companion than my husband, and wonderful people in our lives have supported us in times of need. But in the little daily moments when I feel like getting a pedicure or going to watch the (not so) new Cinderella film, I'm bummed when I realize I have no one nearby to call. I'm not sharing this for pity as that's certainly the last thing I want. Nothing feels worse than knowing you've been included out of charity. I'm sharing because, as I mentioned before, I know I'm not alone. It's funny to say that about a problem of feeling alone, but I've seen similar comments all the time about finding friends as an adult. I'm sharing because when I heard about the upcoming release of Listen, Learn, Love: How to Dramatically Improve Your Relationships in 30 Days or Less! (it's officially on sale today, folks! ), I jumped at the chance to review it. The irony isn't lost on me that I brought the book to read between sets at a social event...instead of being social. I opted to read the book in chunks (the "listen, learn, and love" referred to in the title) to allow myself a full day between to focus on each aspect presented. Of the three, listening is my weakest area (and I totally already knew this), so I had to remind myself to do so in each interaction. Me: Do you have any fun plans this weekend? Her: I'm getting a massage. I'm so excited. I had a hard time finding someone I liked. Me: (who normally would have flipped the conversation to "oh, I hate that" and told my own story) Why is that? Listening is first in the title for a reason: it can be an issue in any relationship from your spouse to your colleague to someone who should be providing customer service. And mastering listening is the first step to learning and loving. This reminded me of all the realtors I passed up last year when we were house hunting simply because I didn't feel listened to. And because I didn't feel listened to, those potential professional relationships never progressed. I found Listen, Learn, Love to be a helpful resource that gave advice in manageable doses, and I especially appreciated author Susie Albert Miller's authenticity. Just as I clearly missed out on relationship-building opportunities by reading during downtime at an event instead of socializing, Miller, the voice of these tips, admits to moments of not always practicing what she preaches. The bottom line? If you're feeling stagnant or unfulfilled by your relationships, there are things you can do. 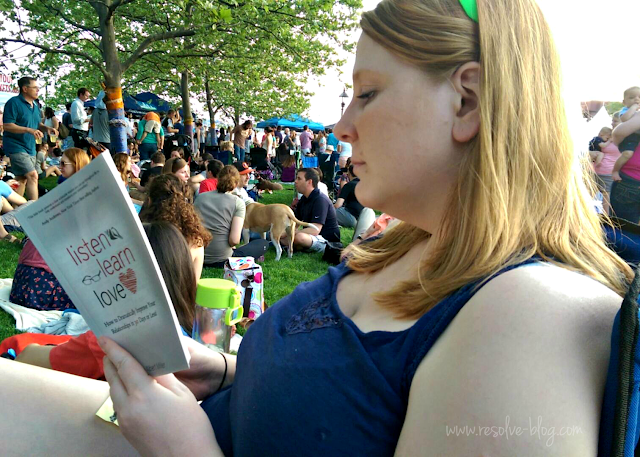 Grab a copy of Listen, Learn, Love and get started!